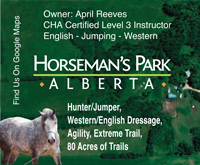 I don’t know her history or how she’s doing now as I haven’t seen her since spring… Anyway he wasn’t my ideal trainer as he was the “old” cowboy type and would run the snot out of a bronc horse, no matter what age. 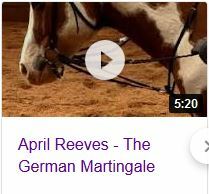 (this filly was only three and he was cantering and loping her constantly and working her really hard). 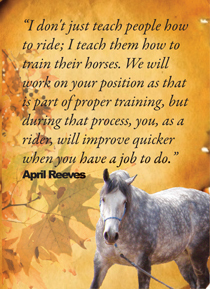 Answer from April Reeves: There are many ways to ask a horse to accept a bit, and although many of those ways end up with a horse that will “take” a bit, the question remains, “Is there a better way?” I have had to work with some of the toughest of bitters, and have barely had as much as a fight or future problem.